Why are there evils in the world? Is human misery God's punishment? The story of Job's visitations forms the basis of a vehement discussion of questions such as these. His friends think his ordeals are a punishment for his sins. Job must humble himself and admit to his wrongs. However, he insists on his innocence and accuses God of treating him unfairly. Do Job's accusations amount to culpable pride, or is it possible for man to take God to task? 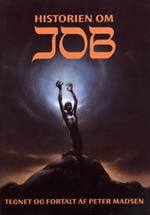 The Story of Job is a rendition of one the most prominent magnum opuses of world literature - The Book of Job from The Old Testament. The text is accompanied by expressive spreads in water colour and gouache, making The Story of Job a picture book for young and old alike. The book is used in confirmation classes and religious instruction in schools. However, it is most certainly a book for adults, too. The Story of Job makes a difficult biblical tale accessible. Buy The Story of Job.